I don't think I will ever bake a cake ever again. These pupcakes (as my kids call them) were so easy and so good and even easier to decorate! I'm not a sweets type of gal. Butter cream frosting is instant death. Chocolate chip cookies (we're talking one or two) have to be washed down with a tall glass of milk. Brownies... I can't stand but a 2" square. These cupcakes were a whole different story though! For the cake part I used a white cake mix and spiffed up using the directions here. I even used the sour milk substitute. 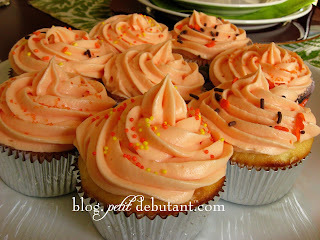 The super delicious frosting was made using Paula Deen's Cream Cheese frosting. Just forget what you put in it so that you can enjoy this guiltless! I have to confess that I hate frosting, but I found myself eating the leftovers by the spoonful any time I happened to walk by the fridge! Yummy! !